Tapestry, also known as needlepoint, can be worked either hand-held or on a frame: both methods have advantages and disadvantages. Although the hand-held method can cause distortion of the canvas (largely dependent on the stitch tension), it has the advantage of allowing you to stitch anywhere (particularly useful for obsessive needleworkers!). Using a frame (available in a range of styles from most needlework shops) keeps the canvas taught and therefore reduces distortion. It also leaves both hands free resulting in faster stitching. The frame does, however, curb your ability to carry your work around with you, although small travelling frames are available. Tension is important in determining how you should work your canvas. Ideally, you should try to keep an even gentle tension, avoiding pulling the thread too tightly. If, however you find your natural tension is rather tight, you may find it helpful to use a frame. It is advisable not to secure your thread with a knot when starting, since knots can cause bumps on the right side of the canvas, a particular disadvantage if you intend to frame your work on completion. The easiest method is to draw a knotted thread down from the right side of the canvas, about an inch (3cm) away from the place you intend to start. Then work towards the knot, catching the thread as you go. After a few stitches cut the thread and remove the knot. To finish off, simply thread your needle through some stitches on the back of your work and cut off any excess thread. 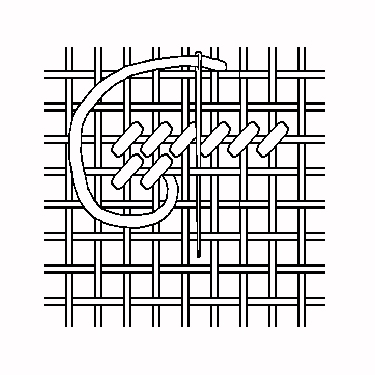 The most common needlepoint stitch is half-cross stitch (see diagram). Work this stitch in rows alternately from right to left then left to right. It produces a short vertical stitch on the back of the canvas. Our kits can also be stitched using Tent Stitch but you may need extra wool. Stitching can be done with one or both hands. The slowest method is to use the same hand to insert the needle, pull it through and replace it, since the hand has to constantly move from the back to the front of the canvas. A very fast single-handed method, best done without a frame, consists of inserting the needle into one hole and out of the other in the same movement. This is particularly useful when working the centre of the canvas, which can be difficult and tiring to reach with other methods. The major disadvantage is that it tends to pull the canvas, so it is particularly important to keep an even tension. Both hands can be employed when using a frame, where the needle is passed through the canvas from one hand at the front to the other at the back. It is essential to centralise the design. This is easily done by lightly folding the canvas in half horizontally and vertically, then stitching along the folds. The centre of the canvas is where the two lines meet, and this can then be matched against the centre of the chart. Each square on the chart represents one actual stitch on the canvas. Different symbols are used to indicate different colours.